Backpackers and young couples prefer to visit Rovinj just for two or three days and the rental season lasts up to six months, which is why there is great demand among buyers for these small apartments. Namely, buying a small apartment in Rovinj is a steady investment which brings back the investment very fast, and it can be easily sold if needed. If you need advice for buying an apartment in Rovinj - contact us. Guide for buying apartments. More about services for buyers! The second floor of a three-storey house in a picturesque village few kilometers from Rovinj is taken by this studio. The apartment measures 20 sqm. 3rd Floor. Living room. Looking South. Located in Rovinj, this bright and airy studio measuring 20 m2 occupies the third floor of a condominium. The apartment offers excellent views of the sea from the studio. The ground floor of a stone building in the center of Rovinj is taken by this traditionally decorated studio measuring 25 m2. The apartment is sold fully equipped, and the new buyer only has to bring along personal belongings. 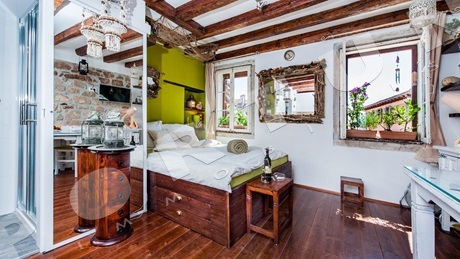 This tastefully furnished studio measuring 30 m2 is arranged over the first floor of a typical old town house in a sought-after place in Rovinj. The third floor of a typical stone house in the center of Rovinj is taken by this rustically restored apartment. The apartment measures 25 sqm. Distance to the beach Monte amounts only 0,35 km.